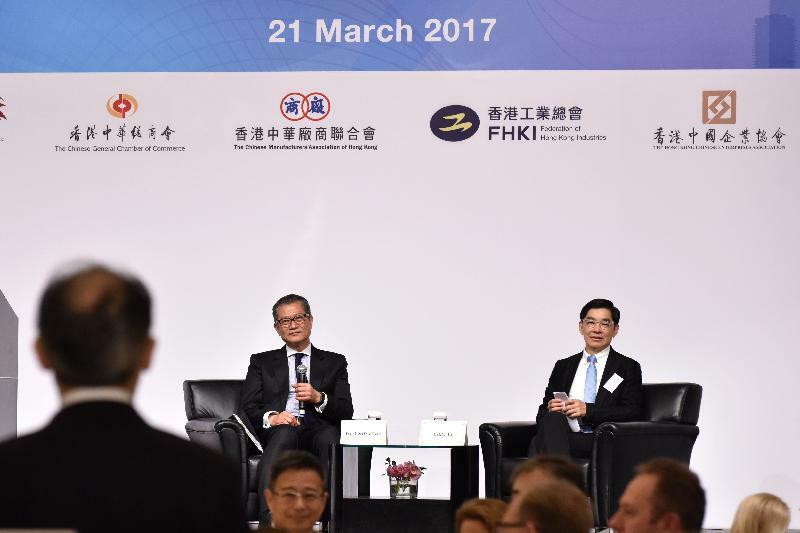 It is an honour to join you all, the great Hong Kong business community, at this annual post-Budget luncheon. It has been a month now since the Budget Speech. And I take heart in the timing of our get-together. We are here, today, on the first day following the Vernal Equinox. Yes, spring officially arrived in Hong Kong early last night. Spring, of course, is the new season. A time of change, of beginnings - in nature certainly and, this year, in politics as well. What with the fourth Hong Kong Chief Executive to be elected in just five days' time. That impending, imposing, reality means that the 2017-18 Budget will straddle two terms of Government, two Chief Executives. That presented a challenge in preparing the Hong Kong Budget for next year. It had to be forward-looking, but without pre-empting too much the next-term Government. It had, in short, to balance the demands for the moment with the needs of the future. On the local economy, we have made, I am pleased to tell you, a good start to the year. The Trade Development Council's Export Index rebounded from 34 in the fourth quarter of last year to 47 through the first quarter of 2017. Our export confidence was up for all our major markets. More recently, Asia's production and trading activities also strengthened. That will lift Hong Kong's goods exports. If the recent improvement in inbound tourism continues, it will surely support our recovery in services exports and retail sales as well. The labour market in Hong Kong, which is in a state of full employment, should continue to underpin local consumption. That's why I forecast the Hong Kong economy to grow by 2 to 3 per cent this year, a modest but welcome uptick from last year's 1.9 per cent growth. Of course, as a small and open economy, Hong Kong is inevitably influenced by external forces. That includes the economy of the United States. We are mindful that the new administration's economic policy agenda remains unclear. While the US may introduce stimulus measures conducive to global economic growth, there is also increasing market concern over whether it will roll out trade protection measures. Last week, the US Federal Reserve raised interest rates for a second time in three months. While the pace of US interest-rate normalisation down the road would ultimately hinge on the developments in the US economy, the forthcoming interest rate hikes could be faster than expected. This will in turn affect global trade, investment and financial flows, as well as local equity and property prices. Then there's Brexit, together with general elections this year in several major European nations. Some have called 2017 "Europe's year of political reckoning". In any case, developments there will further complicate the political and economic outlook for Europe and the world at large. To cope with these, and countless other challenges, we need strategies that help us thrive. Clear, forward-looking policies and initiatives designed to make our public finance as sound and sustainable as possible in today's global economy. We must strengthen the competitiveness of our pillar industries that have served us so well. We must also do what we can to encourage emerging industries. We shall continue our investment in infrastructure, while nurturing talent and promoting innovation and technology. At the same time, we must uphold social justice, enhance Hong Kong's quality of life and ensure that the rewards of success are available to the many rather than the few. That means allocating resources for poverty alleviation, the elderly and the youth. It means promoting a caring and inclusive society, while creating the means to realise upward mobility. In the process, however, we must assess the prevailing funding requirements, and the medium- to long-term financial implications of each proposed initiative. We must adhere to fiscal discipline - to ensure that our expenditure growth will be broadly in line with our affordability. As I have stressed over the past few weeks, windfall revenue of a capital nature is no justification for substantial increases in recurrent expenditure, nor substantial tax cuts. Our fiscal reserves should allow Hong Kong to withstand economic swings and meet the needs of the community - all in a sustainable manner. In this year's Budget, I proposed setting up a tax policy unit to examine issues from a macro perspective. We shall assess the impact on our competitiveness when aligning our tax practices with international standards, and actively study ways to foster development of our industries through tax measures. We shall also enhance our tax regime, exploring options to increase revenue and/or broaden the tax base to provide us with adequate resources to support Hong Kong's sustainable development. Ladies and gentlemen, there is no place in the world quite like Hong Kong: strategically located in the heart of Asia and the gateway to the Mainland, we boast world-class infrastructure, a free enterprise system both highly flexible and efficient, and the unique advantage of "one country, two systems". Add to all that a low and simple tax regime, the free flow of capital, people and goods, and a pluralistic society that embraces the rule of law, and you can understand why we have come as far as we have. Why our pillar industries have served us so well. Indeed, trade and logistics, financial services, business and professional services, and tourism collectively contribute close to 60 per cent of our GDP and about half of our employment opportunities. To consolidate these industries, it is essential that we enhance their competitiveness. Starting with the trade and logistics industry. And for good reason. Despite the relatively small scale of our economy, Hong Kong is the world's eighth-largest trading entity. We rely heavily on the export and re-export business. The Government will continue to expand our free trade agreements and Investment Promotion and Protection Agreement (IPPA) networks. Our IPPA with Canada entered into force last September, while that with Chile was concluded last November. In all, we have signed 19 IPPAs to date, with more on the way. Negotiations with Mexico, Iran and Russia are ongoing. At the same time, we will continue to explore further expansion and enhancement of CEPA, and carry on with the negotiation of free trade agreements with ASEAN, as well as Georgia and Maldives under the Belt and Road Initiative. We are, as well, working to establish a Trade Single Window to promote cross-border customs co-operation and expedite trade declaration and customs clearance. We will continue to work closely with the industry to foster the long-term development of high value-added maritime and port services, as well as high-value-added transhipment, cross-boundary e-commerce and air cargo business. We place importance, as well, on helping Hong Kong businesses find new markets for their products and services. Last year, we opened an Economic and Trade Office (ETO) in Jakarta, Indonesia - our 12th ETO - to boost our ties with ASEAN countries. This year, we are working to set up new ETOs in a number of other countries, including Korea, India, Mexico, Russia, South Africa and the United Arab Emirates. At the same time, we are expanding our presence in the Mainland, adding four more liaison units - in Tianjin, Zhejiang, Guangxi and Shaanxi - this year. Competition is fierce, endlessly so, among the world's major financial centres. We must ensure that our financial market remains competitive, robust and of the highest standard. Hong Kong is in the process of joining the Asian Infrastructure Investment Bank (AIIB) as a non-sovereign territory. With extensive experience in implementing, managing and operating infrastructure projects, and a sophisticated and liquid financial market, as well as the availability of a wide range of top professionals, Hong Kong can contribute to the success of AIIB and further reinforce our position as a premier international financial centre. Meanwhile, we are proposing to extend profits tax exemption to onshore privately offered, open-ended fund companies. This should attract more funds to Hong Kong, enhancing our fund-creation capabilities, and will help boost Hong Kong into a full-fledged fund service centre. There is a promising future in aircraft financing. And we plan to offer tax concessions in this area, further strengthening our status as an international financial centre. Tourism has long been a pillar industry, helping drive the growth of related industries and businesses. It has, recently, experienced challenges and may continue to do so in the coming year, which is why my Budget introduced several support measures. The Amendment Bill will be introduced to the LegCo by the end of June this year. We have also earmarked $243 million to enhance Hong Kong's appeal. That includes supporting local mega-events, promoting diversified tourism products, providing funding support for our cruise business, as well as training for members of the tourism industry. We are also promoting Hong Kong's role as a major business services centre. Last November, we launched the $200 million Professional Services Advancement Support Scheme to support our professional services sector. All well and good. But if we are to remain a consequential player in the global economy - today and tomorrow - we need to move beyond our pillar industries. And we are doing so, investing heavily in innovation and technology (I&T) to power our future. Indeed, we have come a long way since the establishment of the Innovation and Technology Bureau, 16 months ago. A variety of policies and programmes, totalling about $18 billion, have been launched to promote I&T. And, in this year's Budget, I earmarked another $10 billion to boost the I&T sector. This is no small commitment. I shall set up a committee on I&T development and re-industrialisation. I shall also explore super tax deductions for R&D expenditure under the new tax policy unit. If I&T is about business, about doing it more efficiently, it is also about quality of life. It's why we are committed to developing Hong Kong into a smart city. Why a comprehensive smart city study is under way. It is also why we shall launch the $500 million Innovation and Technology Fund for Better Living by the middle of this year. The Fund is all about improving the daily lives of the people of Hong Kong, including our underprivileged and our elderly. Including all of you here today, of course. And we look forward to getting your can't-miss inspirations. It is equally important for our SMEs adopt I&T to enhance their competiveness. It's why, last November, we introduced the Technology Voucher Programme. It provides each eligible SME with funding of up to $200,000. The programme promotes the use of technological services and solutions for better operational efficiency, while creating business opportunities for our I&T industry. The response from SMEs has been encouraging, I am pleased to note. SMEs' vitality and business prowess are of crucial importance to the development of our economy. To the future of Hong Kong. With that in mind, and considering the tentative performance of the global economy, my Budget offers a number of support measures for our SMEs. These have been highlighted earlier on by Stephen so I am not going to repeat here. Ladies and gentlemen, we are as determined as you are to build a better Hong Kong. For ourselves and our businesses, sure. But also for the community we live and work in, the community our children will one day inherit. 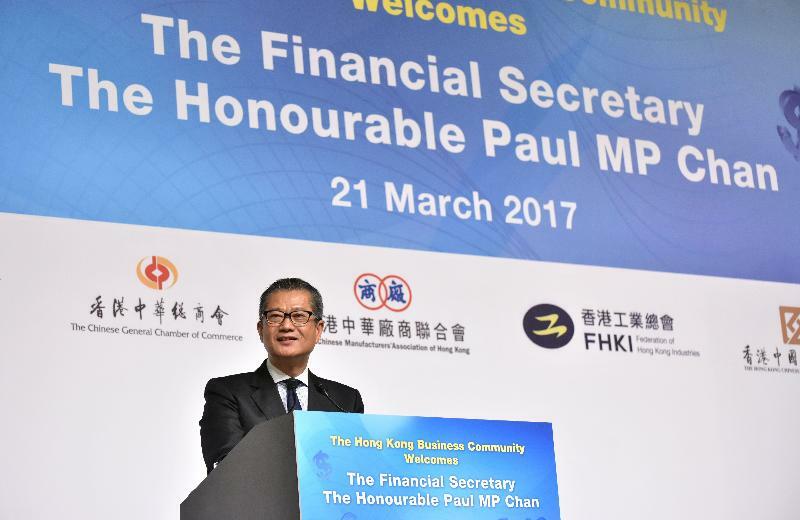 My thanks to the Hong Kong General Chamber of Commerce and the many other Chambers, local and international, that helped make this luncheon possible. And that help, day after day, to realise Hong Kong's future. I wish you all prosperity and good health in 2017. And I know you will enjoy the many delights of spring in Hong Kong - without, of course, neglecting the imperatives of the seasons to come.